In addition to the guidelines stipulated in DepEd Order No. 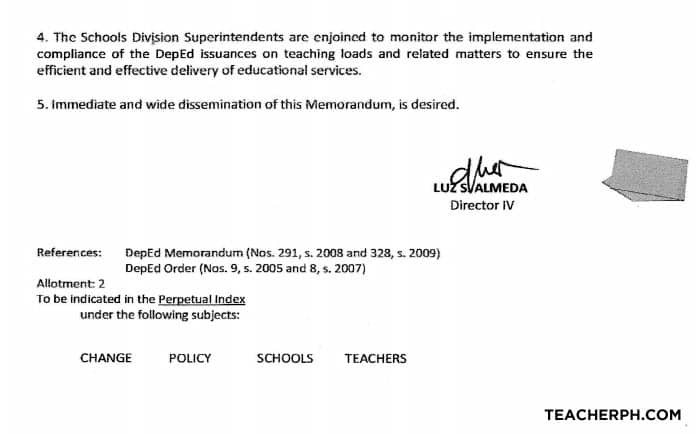 31 s. 2012 which is still in full force and effect as per DepEd Order No. 20 s. 2014 particularly on time allotment per learning area and in the preparation of class program, DepEd-NCR Memorandum No. 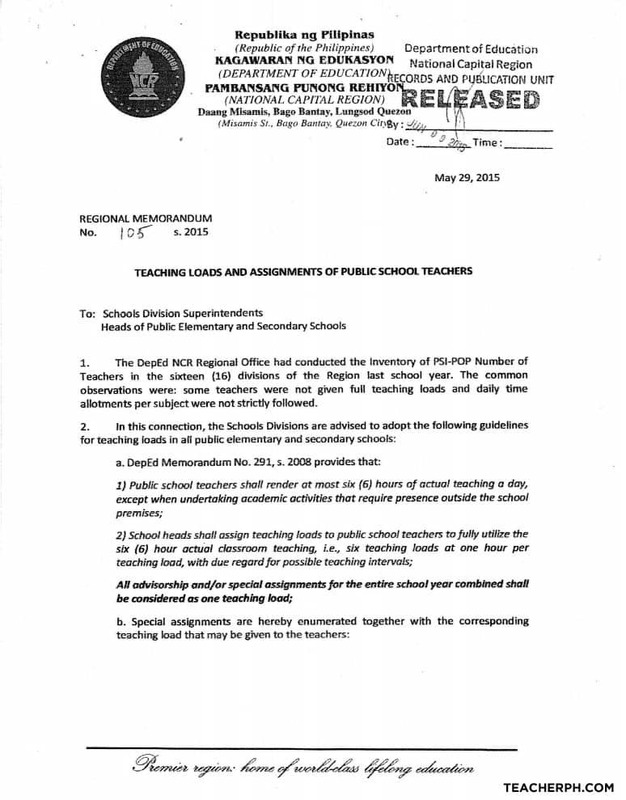 105 s. 2015 dated May 29, 2015 entitled: “Teaching Loads and Assignments of Public School Teachers”, is hereby attached to guide the school heads in assigning teaching loads. 1. The DepEd NCR Regional Office had conducted the inventory of PSI-POP Number of Teachers in the sixteen (16) divisions of the Region last school year. The common observations were: some teachers were not given full teaching loads and daily time allotments per subject were not strictly followed. other activities identified in the specific guidelines under paragraph 4 below. d. Schools with 2 shift classes should give additional homework to students to make up for reduction of time allotment. e. As per DepEd Order No. 9, s„ 2005, national, regional or division athletic meets or academic and non-academic competitions, including practices for said meets and competitions shall be allowed on condition that these are held after class hours and days. The specific day and time should be reflected in School Form 7 (SF7). 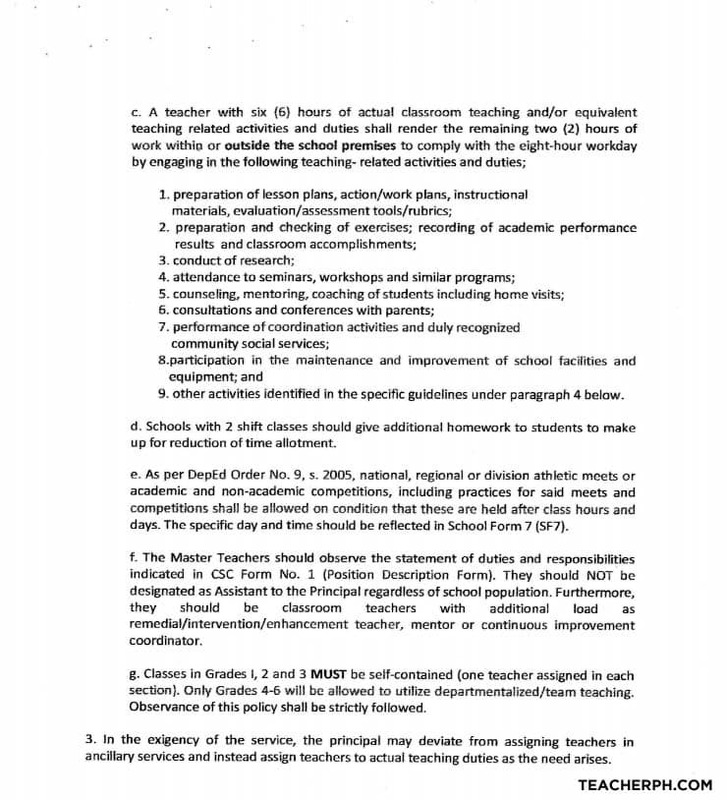 f. The Master Teachers should observe the statement of duties and responsibilities indicated in CSC Form No. 1 (Position Description Form}. They should NOT be designated as Assistant to the Principal regardless of school population. Furthermore, they should be classroom teachers with additional load as remedial/intervention/enhancement teacher, mentor or continuous improvement coordinator. g. Classes in Grades I, 2 and 3 MUST be self-contained (one teacher assigned in each section). Only Grades 4-6 will be allowed to utilize departmentalized/team teaching. Observance of this policy shall be strictly followed. 3. In the exigency of the service, the principal may deviate from assigning teachers in ancillary services and instead assign teachers to actual teaching duties as the need arises. 4. The Schools Division Superintendents are enjoined to monitor the implementation and compliance of the DepEd issuances on teaching loads and related matters to ensure the efficient and effective delivery of educational services. 5. Immediate and wide dissemination of this Memorandum, is desired. Multi grade level or English and Filipino combined as (1) class, at one (1) schedule is still considered single (one) load. This may be a subject taken in lieu of Technology and Livelihood Education (TLE); hence, for the nomenclature in the DepEd forms, it shall appear as = TLE/Journalism. For small schools where English and Filipino classes are. combined or where the classes are composed of different grade level, that are conducted as one (1) section, the load will be considered only one (1). To complete the load of a Journalism teacher, he/she must be assigned in English or Filipino to teach subject/s to allow more opportunities to discover potential journalists in the class/school. Number of Feeding Teacher may vary depending on the number of enrolment and feeding programs. 3 hours library duties Number of Teacher Librarian may vary on the number of enrolment. 3 hours guidance services Number of Guidance Teacher may vary on the number of enrolment. 1 SPA Legal Basis: RA 7079, sec. 2 Implementing Rules and Guidelines. See Inclosure A for details.